Your average person in America today is barely getting by, living month to month with debt hanging over their heads. For me, my life depends on the outcome of the current occupy revolution. If social security is cut off, I may find myself homeless, but only for six months or so, because without medical coverage I will die. Our economic system is set up wrong, the national treasury loans money they don’t have to a government that can’t repay it? What?, so the value of the dollar goes down and our cost of living increase is ignored? Big banks are bailed out after illegal activities/ cons that end with them getting high interest and a lot of foreclosures, yes kicking people out of their homes!, then getting bailed out by OUR government, who then raises taxes on the average American to pay for it. Please watch this video to become more informed about this. Then there are the wars, our country is in debt, fighting for the rights of other people in other countries. So who pays for this? Your average American. 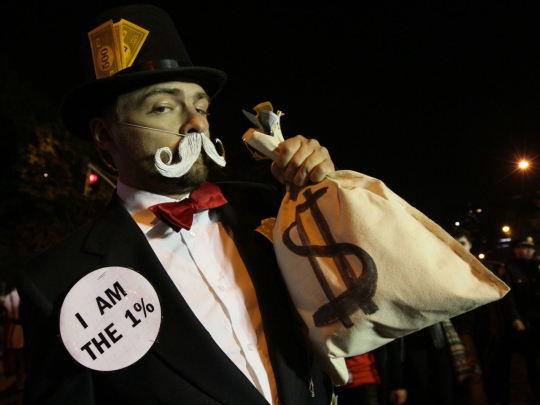 So what about the mega rich one percent? They are getting HUGE tax breaks! This is no longer a Democracy it has become a plutocracy! 2. a state having such a form of government: The United States and Canada are democracies. 2. a government or state in which the wealthy class rules. 3. a class or group ruling, or exercising power or influence, by virtue of its wealth. Please read our Bill of Rights then you tell me if what the rich have done to get richer seems legal to you?